The United State's tallest stratovolcano overlooking the first magenta paintbrush (Castilleja parviflora), pink mountain heather (Phylodoce empetriformis), fan-leaf cinquefoil (Potentilla flabellifolia), pasqueflower (Anemone occidentalis), and small-flowered penstemon (Penstemon procerus) blossoms of the year. Taken at 5,800 feet along the Dead Horse Creek Trail at Paradise, Mount Rainier National Park in Washington State. The alpine and subalpine wildflower meadows and parks of MRNP are amongst the grandest in the world. 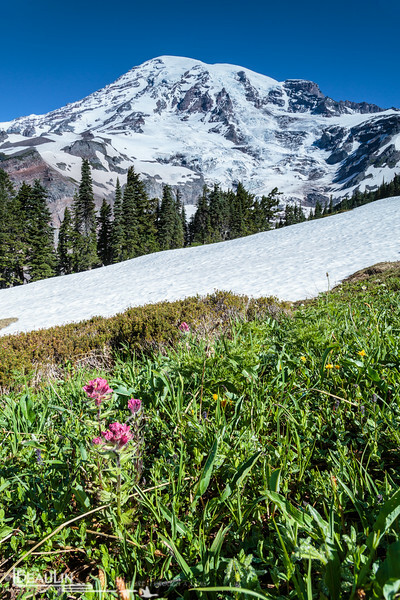 The peak bloom is delayed in years of heavier and later than normal snowpack such as the winter of 2013-14. This shot comprises 6 images focused at different distances, and blended during post-processing to achieve maximum depth of field and image sharpness. A 3-stop graduated ND filter, and polarizing filter were used to control the wide dynamic range and glare in the scene.